Yesterday morning I was trying to catch up with all the exciting events in São Paulo that I had missed by being in the US last week. And of course, Folha de São Paulo is my first and favorite source. 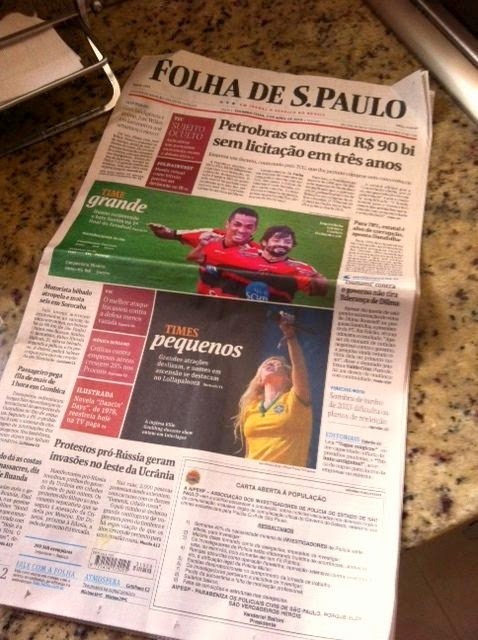 Top of the front page was dedicated to more bad news about Petrobras and corruption, plus a giant photo of Ituano players beating Santos in the state futebol championships. Who is Itauno? No clue, but one of their players is named "Esquerdinha" or "little left". Hmmm, either he is a member of the Partida de Trabalhadores (PT) or the socialists or something on his left side is little. Never mind. Below the fold, we got a photo of a singer at Lollapalooza Interlagos, la de da, and the Ukraine. But what's this official looking box at the bottom? It is an Open Letter to the Population. That's me. Let's read. 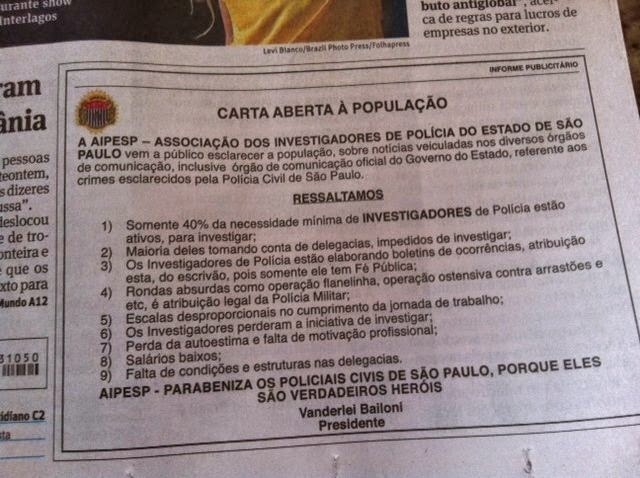 The Association of Police Investigators (Civil or Investigative Police) of São Paulo state would like to state the following (more or less, okay? This is my rapid-fire translation). 1. Only 40% of the minimum necessary number of police investigators are "active" to investigate (huh? Are the rest on vacation? Read on). 2. The majority of these active investigators are taking care of police stations rather than investigating (you know, I heard this from the Military Police as well. They actually have to clean their own police station). 4. Absurd operations like "operação flanelinha" or the dudes that want a buck to watch your car (see blog post on this here), and operations to prevent mass crime should be the province of the military police (note that they are saying the operations are absurd, so might as well hand them off). 9. Police stations that are falling apart. And then the coup de grace--the association of investigators congratulates the Civil Police of São Paulo because they are "Real Heroes". And it's signed by Vanderlei Bailoni, the president of said association. Wow, I have never seen this before. It would be like the police union of Connecticut (my home state) writing a letter on page one of the oops, no state newspaper--let's go with the Hartford Courant--saying that in spite of the terrible conditions, our police men are heroes. And so they are. All irony aside, you know I am sympathetic to the police here. I have the luxury of not having been here during the military dictatorship and seeing what bad stuff happened. What I do see today (though I have better knowledge of the military police than the civil) is that these guys are undertrained, underpaid, overworked and very much underappreciated. Maybe I'll write a letter.